Today, to play Heavy/Power Metal is a hard trial to deal with. Due the flood that happened between the middle of the 90s and in the first half of the last decade, many bands eroded the genre and created a very unfertile scenario for the beginners. But resilience is a main feature that drives many bands, including the German quintet GLORYFUL. 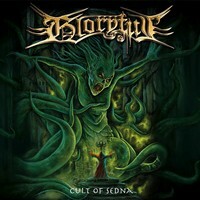 Now they’re back for one more round with “Cult of Sedna”, their lastest album. They’re into a melodic way into what names as GRAVE DIGGER, CROSSFIRE and others did in their earlier works, with a very good melodic aesthetics (including excellent choruses), but with a great and heavy musical weight. It’s heavy and aggressive, but melodic and charming in a way that will get you with their songs. And if their main genre isn’t something that the Metal fans never heard before, it sounds with a great and bold personality pulsing on their songs. Jörg Uken (a German producer who worked previously with ANVIL, SUICIDAL ANGELS, GOD DETHRONED, IZEGRIM, SINISTER and others) mixed and mastered “The Cult of Sedna”, creating a clean and heavy sound quality for the album. It sounds heavy and aggressive, but melodic and clear as well, so the songs gain a strong and heavy life due his work. “Cult of Sedna” sounds a bit more melodic and as not as aggressive as their previous album, “End of the Night”. It’s another face of their own music, and be prepared to be taken by assault by songs as the sharp and hooking “The Oath” (a very good song, with a great work from bass guitar and drums on the rhythmic changes, but with very good guitars as well), “Brothers in Arms” (the Heavy/Power Metal melodic insight is excellent, with great vocals with mid-range tunes and backing vocals), “The Hunt” (excellent piledriving drums on double bass, but with the right aggressive scent given by the guitar riffs), “True ‘Til Death” (a Hard Rock driven song, with melodies can be understood easily, macho backing vocals and excellent melodic lines), “Desert Stranger” (another song guided by a Hard Rock feeling on the melodies, but showing excellent guitars once more), and “Sinners & Saints” (an aggressive song with a clear melodic touch during the chorus). These ones can be named as the best songs of the album, but it’s truly amazing from the beginning to its end. Let GLORYFUL charm you with “Cult of Sedna” and you won’t regret of it. It’ the opposite: you’ll complain to yourself for not knowing their work previously!